FB2 format is an ebook extension that lets you read books on your computer or mobile devices. Unfortunately, this format isn’t supported by the default computer programs and one needs to install special software to open and view this type of files on a PC. Icecream Ebook Reader is a decent FB2 reader with the ability to make up your own digital library, manage it, and use special tools for a more comfortable reading experience. 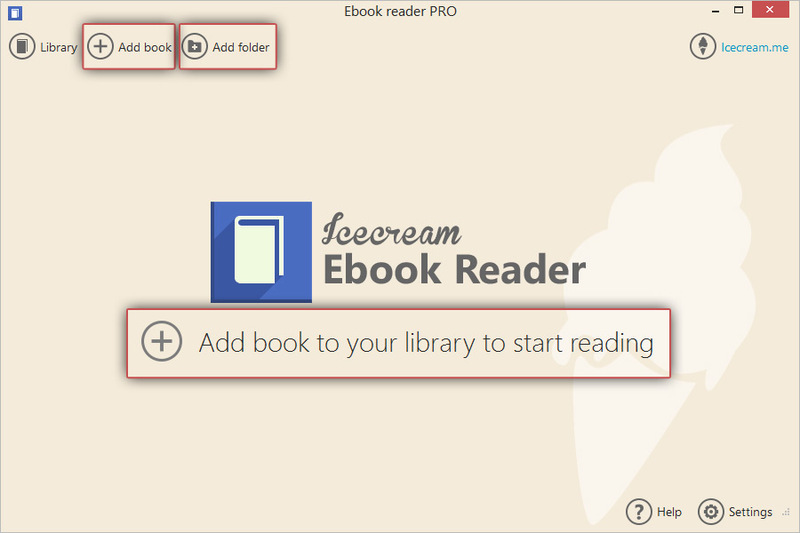 Check out this article to learn more about how to open FB2 files with Icecream Ebook Reader. The first thing you need to do is download Icecream Ebook Reader and install it onto your computer. Save the .exe file on your hard drive and launch it to start installing the program. The Setup Wizard will guide you through the process and help you complete it in less than a minute. Once that’s done, open the program and familiarize yourself with the interface. Click the “Add book to your library to start reading” button in the center of the main window to add your first FB2 book to the library. Use Windows Explorer to browse your hard drive and find FB2 files on your computer. You can also use the “Add book” button in the top of the program's window for that. To add folders containing multiple FB2 files click the neighboring “Add folder” button. In addition to that, you can turn to drag and drop mechanism and simply drag the ebook files into the window of Icecream Ebook Reader. All the added books can be accessed through the program's Library (click the “Library” button in the upper left corner of the main window to open it). There are two ways of displaying your books: Table view and Bookshelf. The first one shows some information about the files (book’s title, author, progress, and date of addition to the program's Library, number of the added notes and highlighting, options to add a book to Favorites and delete a book) while the second one helps you easily find a necessary book by its cover. 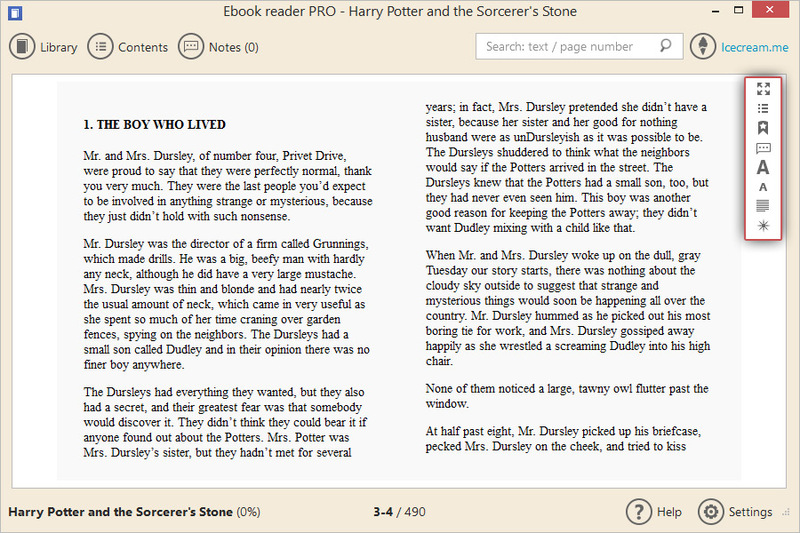 To choose a Library view mode, click the button at the top of the ebook reader's working area. Formats – to sort our the books by the formats click the “Formats” option to unroll the list of the formats of the ebooks that are currently added to your Library. The program supports the following ebook formats: ePub, MOBI, FB2, PDF, CBZ, CBR. Deleted – if you delete a book from the Library, it gets to this folder. From this folder you can either totally delete books or restore the deleted books to the Library. The “Settings” button in the bottom right corner of the main window of the ebook reader gives you an access to the Settings panel. You can read more about all the available options that can be customized in the panel in this article. To open FB2 files, double click a book’s thumbnail. 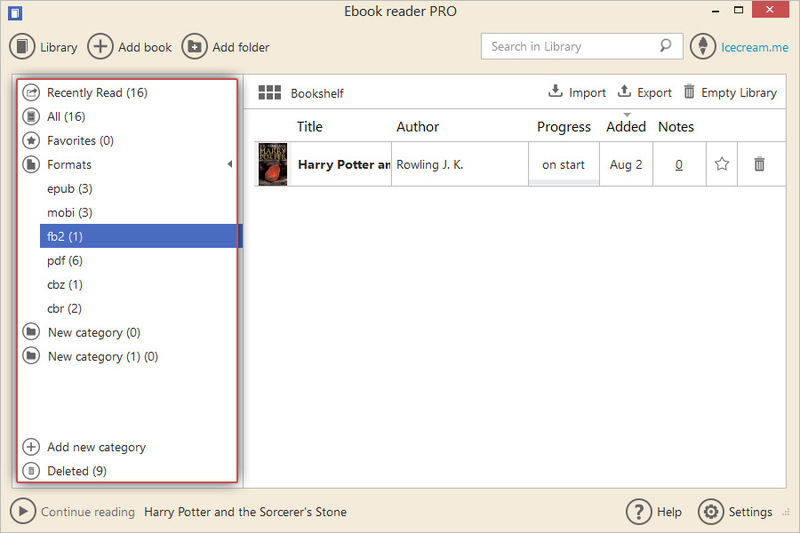 If you’ve already built a large library and can’t find a desired book in the list, use the search box in the upper right corner of the program's window. The book will be opened in the reading mode and you can click on the left and right sides of the pages to turn them (it’s also possible to press “Left”/“Right” and “Space”/”Backspace” keys on your keyboard to do that). For a more convenient reading experience, this FB2 reader features a toolbar at the right side. In here, you can view the file in a full screen mode or switch back to the windows mode (F11 button), open to the table of contents and list of bookmarks, bookmark a page, open the notes panel of a book, change font size (both increase and decrease, and change page view (single or double page layout) and profile (Day, Night or Sepia) respectively.